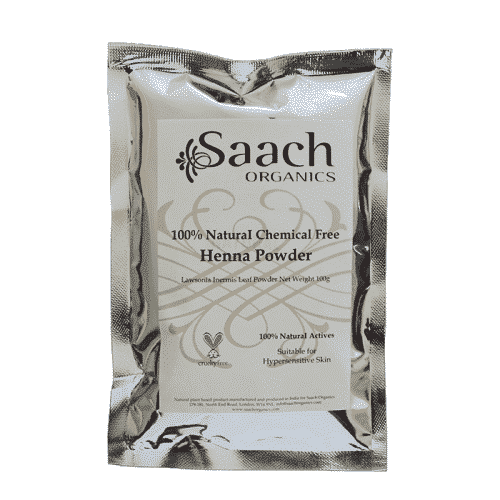 Saach Organics natural chemical free henna powder is 100% pure natural body art quality. It is grown and hand-harvested from Rajasthan northern India. Milled to a fine powder and triple sifted to give maximum pigment release our henna will give your hair a long lasting beautiful rich colour. Used regularly the natural nutrients in the henna will condition the scalp, follicles and hair shafts, and thus will help to repair damaged hair to give you smooth, silky, nourished and healthy head of hair. Henna will give different results depending on your original colour. Used on Brown hair it will give you red/brown undertones, on white/grey or light coloured hair it will give you a more orange to red colour. Used in conjunction with Indigo powder you can create a unique array of shades from red/brown through to black.